How About Gun Control for the Pentagon? For all the droning on about US gun violence, it would be good to hear someone drone on just a bit about US drones. “There has to be a national conversation” about gun control, says Nancy Pelosi. The killing of school children and teachers in Newtown, Connecticut and other shootings since have turned up the heat. Too right. Pelosi wants to see action. The president’s demanding it too. So are state leaders. New York Governor Andrew Cuomo, who has his sights set on the presidency (if you’ll excuse the expression), has proposed not only rewriting the state’s existing assault weapons ban but also more expansive mental health checks and background checks of gun buyers, lower limits on how many bullets a single gun magazine can fire and a new requirement that gun buyers be periodically recertified. There’s just one piece of the picture missing. Now that lawmakers, DAs, governors and the White House have all agreed that gun violence is wrong, when are we going to start talking about troops and bombs and drones? You think American weapons are a problem in the US? Take a look at what American weapons are dong outside the country. US troops carry US guns too, of course. Last March, an army sergeant used his to methodically slaughter sixteen civilians, including at least nine kids in their homes in southern Afghanistan one Sunday morning. And then there are those drones. Seven drone attacks in the last two weeks have killed an estimated forty people in Pakistan and Yemen so far this year and we're not even half way through January. The Bureau of Investigative Journalism reports that from June 2004 through mid-September 2012, drone strikes killed 474-881 civilians, including 176 children. 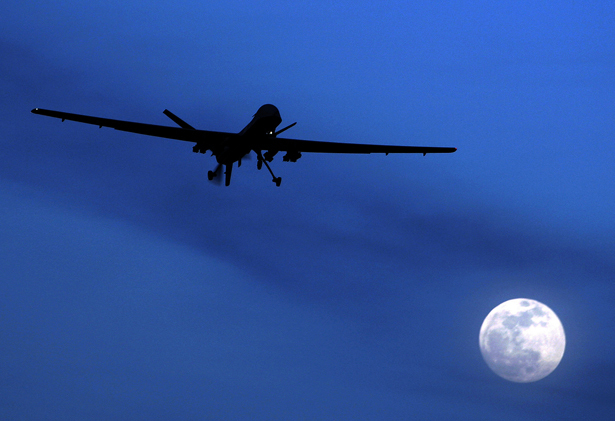 For all the droning on about violence, it would be good to hear someone drone on just a bit about drones. The good news is surely this. We’re finally taking aim at gun violence (as the headline writers say). The powerful gun lobby the National Rifle Association has taken some hits. Thanks to Lee Fang, we know all about their corporate backers, and NRA President Wayne LaPierre came in for no end of grief when he finally broke his post-Newtwon silence and suggested stationing more shooters in more schools. Arm schools to protect schools? Ridiculous. Except that's exactly US foreign policy. The NRA works for its corporate partners no harder than the State Department works for theirs. US government-brokered arms sales tripled to a record high in 2011: $66.43 billion dollars, more than three-quarters of the global arms market, driven by major arms deals with Persian Gulf states. For all the talk of background checks stateside, when the US approved a $30 billion deal with the authoritarian state of Saudi Arabia, it wasn’t the background, only the size of the check that got much attention. (President Obama said the sale would be good for jobs and the State Department said that in such an insecure region, the arms deal would be good for sercurity.) And when was the last time we periodically recertified Israel? The United States last year did its best to keep ammunition out of a new treaty on small arms, and the Land of the Free won’t even sign the international ban on land-mines. If the president really wants action on high-capacity killing, how about a deal: gun owners give up Bushmasters when the US agrees absolutely to ban cluster bombs? It may be I’m getting ahead of myself. Perhaps we should aim a little lower. One step at a time. Set our sights on just one handgun a month. And how about just one shooting metaphor? At least that would be a start. For more on America's foreign vigilantism, read this excerpt from Nick Turse's new book, Kill Anything that Moves: The Real American War in Vietnam.